Bellevue root beer maker Kainoa Lopez moved his operations to Boise this month to seek accounts in the state capital. 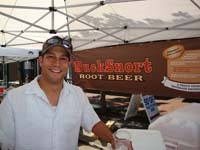 Lopez founded BuckSnort root beer in Bellevue in 2009. The brand quickly took off at farmers markets in the Wood River Valley and in Boise. BuckSnort is now available at 20 pubs and restaurants in southern Idaho. Lopez, 37, grew up on the north shore of Oahu and in Olympia, Wash. He worked for a few years at Hailey telecommunications software-company Marketron before moving on to competitor Wide Orbit in San Francisco. He was working from home in Bellevue when he was laid off in 2009. That was when his work went from the high-tech to low-tech. He who sold his first mug at the Hailey Fourth of July parade in 2009. By the end of that summer, he was selling two to three kegs per week at farmers markets in Hailey and Ketchum. His first wholesale account was with McClain’s Pizza in Hailey. BuckSnort is made using no artificial colors, flavors or high fructose corn syrup. It’s caffeine free and gluten free, sweetened with evaporated cane juice. “It’s made the way sodas were made 100 years ago,” Lopez said. BuckSnort now has 100 kegs in circulation, distributed by local food distributor Idaho’s Bounty. Lopez said he sells about 50 kegs each week, but he hopes that will increase with his move to Boise. Lopez was recently appointed to the board of directors of the Capital City Public Market in Boise, where he has sold BuckSnort for several years. “I’ll be able to build relationships with Boise restaurants, just as I have in the Wood River Valley,” he said. Lopez said he’s looking at bottling and canning BuckSnort, but knows it would be a big step financially. “There have been a lot of conversations about raising capital,” he said.